Do you have a recipe for brining chicken? 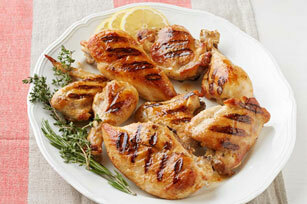 Brining boosts flavour and adds extra moistness to our cooked grilled chicken recipe. Remove and discard skin from all chicken pieces except wings. Add all chicken pieces to large resealable plastic bag; place in shallow dish. Bring 2 cups water, lemon peel, salt, garlic and herbs to boil in saucepan. Remove from heat; pour into large bowl. Add remaining water, dressing and ice; stir until ice is melted. Pour over chicken; seal bag. Refrigerate overnight. Remove chicken from dressing mixture; discard dressing mixture. Pat chicken dry with paper towels. Let stand at room temperature 20 min. Meanwhile, heat greased barbecue to medium-high heat.